Powder Houses were purpose built structures. Here are a few examples, showing different designs. Click on the thumbnails for a larger view and explanation. 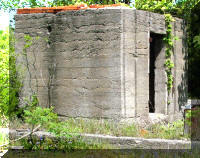 These 4 pictures are of the S. S. & G. Powder House, west of the Central Mill. Bilharz- Bluebird Woodchuck Mystery? Mystery?